Sealed and Safe Mouse Traps for killing, stopping and getting rid of problems with mice. The Sealed and Safe Mouse Trap is a new type of trapping method that quickly catches, kills and conceals the dead mouse from view. 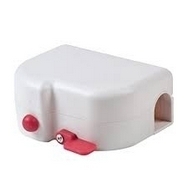 Ready to use, these throw away mice traps can be for eradicating house or garden mice and once used they can then be thrown away without you having to see the dead mouse. Alternatively, you can empty the trap and re-use.